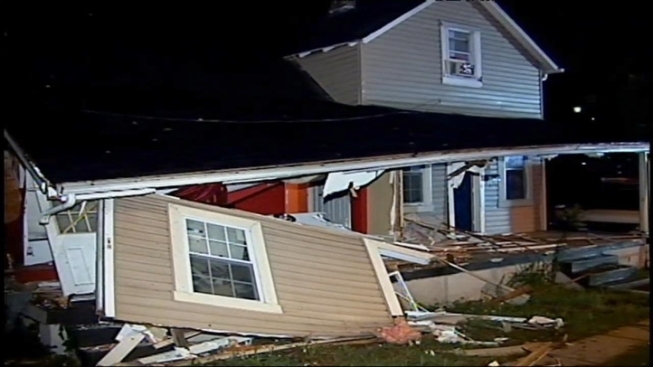 A Ford SUV barreled into a house in Riverdale last night and caused massive damage. The accident happened around 4 a.m. on East Beale Circle near East West Highway. Dramatic images from the scene show the vehicle went through the front of the house, missing the front door but knocking down two walls of the house. One of the windows from the house came to a rest in front of the Ford's bumper. Fire and building inspectors were called to the scene early Sunday morning, and it was declared condemned and uninhabitable. The family of five were home at the time of the crash but did not sustain any injuries. East West Highway, which runs in front of the house, shrinks from three lanes to two in front of the damaged house. Neighbors say they have seen accidents happen there at the narrowed roadway in the past, although never as severe as this one.